Do you see our smiles on the photo below? Ferry Shipping News is one year old. Yes! Our little digital baby has grown considerably, and we are delighted by the support we get from you all. Thanks for making this double project –Ferry Shipping Summit and Ferry Shipping News– possible. We love what we do! We believe very much in the power of the network. What we like the most is to meet you in person, at our Ferry Shipping Summit (don’t forget to block the dates: 20-21 March, 2019). However, connecting via LinkedIn is important too. In LinkedIn we believe. You are very welcome to connect with us. It will strengthen your network too. Coffee and water to celebrate one year of Ferry Shipping News? We had wine in the evening…but don’t tell anybody. 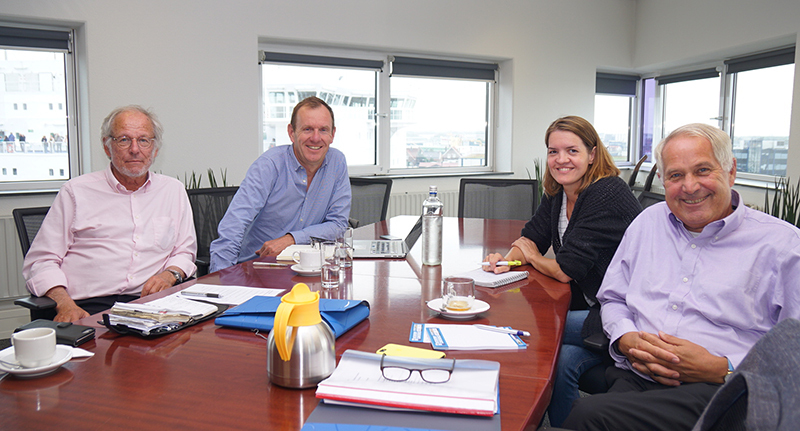 This picture shows the core team of Ferry Shipping News. You can connect on LinkedIn by clicking on the logo. Bo-Lennart Thorbjörnsson: enthusiastic co-founder of the modern Ferry Shipping Summit and News. Long-time top executive, adviser and board member in the European ferry industry. Lives in his birth town Halmstad, Sweden. Travels a lot to meet industry friends. Mike Louagie is Ferry Shipping News’ editor. Freelance photographer, writer, lecturer, story teller, etc., as long as it is related to ships. Lives in Ghent, Belgium (not home often though). Sandra Snijder is ‘WebMevrouw’ and the content manager and designer of the promotional material for Ferry Shipping Summit and Ferry Shipping News. Frans Baud is co-founder of the Ferry Shipping Summit. He is a 30-year maritime and logistical services veteran with broad expertise ranging from control, inspection, analysis and certification to ship brokerage, commodity logistics, terminal operations, forwarding and supply chain management systems.